In Prague, at the 1936 World Championships, at the quarter-final stage of the men’s singles event, he beat England’s Adrian Haydon; he prevailed in three straight games (21-9, 21-11, 26-24). At the time, he was 16 years and 341 days old. It is that achievement at the forthcoming Liebherr 2019 World Championships, Japan’s Tomokazu Harimoto seeks to beat. Today, Wednesday 10th April, we mark 100 years since the birth of one of our greatest ever champions, Richard Bergmann. If on Wednesday 25th April, a significant day, the day of the Swaythling Club Annual General Meeting who present a sportsmanship award in honour of Richard Bergmann; if in the Hungarian capital city, Tomokazu Harimoto is present in the men’s singles quarter-finals and he wins, he will be 15 years and 302 days old. It is his last chance to beat the record set by Richard Bergmann and become the youngest ever to win a World Championships men’s singles medal. An immediate goal for Tomokazu Harimoto but if he or any player of the modern era is to match Richard Bergmann, then they have some distance to go; if anyone succeeds they will become immortal not only in table tennis but in the world of sport. After reaching the semi-final in 1936, Richard Bergmann won in Baden the following year; he prevailed again in Cairo in 1939, before once more succeeding in 1948 in London and 1950 in Budapest. Overall, taking into account the full gambit of World Championship events, he won seven gold, six silver and nine bronze medals. Comparing eras is always fraught with inconsistencies; nowadays, the World Championships and the World Team Championships alternate on an annual basis; in the era of Richard Bergmann they were combined and organised each year. However, balance that fact with following Cairo in 1939 until Paris in 1947, owing to World War Two, no World Championships were staged. 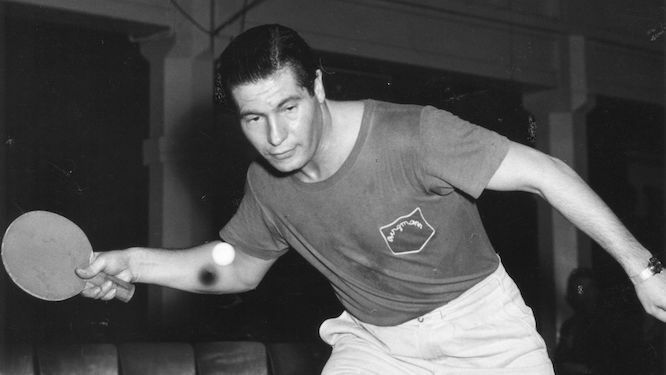 Born in Vienna, his mother Italian, his father Polish, he started to play table tennis in 1931; five years later in Prague he made his debut and experienced the strangest ever men’s team final. Facing Romania the Austrians recorded a 5-4 win; the contest took 12 hours and lasted three days! Scores level at 2-2, it was 2.00 am in the morning, the police stormed into the hall and stopped the contest; they continued the next evening eventually concluding proceeding after the singles events had finished! Equally, in that tournament, his men’s singles semi-final defeat at the hands of Poland’s Aloizy Ehrlich was unusual (16-21, 21-16, 21-18, 21-10). They started at 7.00 pm; after playing for almost one hour Aloizy Ehrich led 2-1 in games but dinner in the Lucerna Hall closed at 8.00 pm. They agreed to stop playing; they went for dinner and then returned to complete the match! It was the tournament that ignited a remarkable career, relating titles won and the stories of Richard Bergmann would fill many megabytes of a modern day blog; it was life totally different to that of Tomokazu Harimoto who seeks to break his record of the youngest ever. Smartly dressed, well presented, great attention to detail; they are common factors with the Japanese teenager but that is where the likeness ends. Richard Bergmann didn’t smoke but always carried a smart cigarette case should a female smoker acquaint his company; he spoke seven languages fluently and made his own rackets, always covered with just a layer of pimpled rubber, for Richard Bergmann, the sponge innovation was the number one enemy. He lived in time of political upheaval, in 1939 as a result of Hitler’s annexation of Austria, Richard Bergmann moved to England; when he won that year in Cairo, theoretically he was stateless. He was totally single minded, restless, a maverick; in 1951 he played exhibition matches in South Africa, contrary to the request of the English Table Tennis Association. He was suspended, the sadness being that he was denied the chance to play in the World Championships staged that year in his home city of Vienna. A controversial figure, he challenged the authorities but by doing so he played in front of what is surely the biggest crowd ever to watch a table tennis match. Competing against Japan’s Norikazu Fujii in Sofia, as the crowd awaited the Harlem Globetrotters to behold the mesmeric basketball skills of the clown prince Meadowlark Lemon; to the strains of Sweet Georgia Brown the duo played in front of a crowd of some 45,000 spectators in an open air stadium. Exhibition matches became his forte; it was to be where his career finished. In late 1969 he was taken ill when playing at the Pontin’s Holiday Camp in Southport on the west coast of England. In hospital in nearby Liverpool he was diagnosed to have a brain tumor. He died in London on Sunday 5th April 1970. Four days later his body was cremated in New York where his sister lived, a human irony; the man who had thousands of friends all over the world, was a world champion, he had no home of his own.